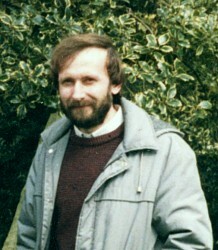 Lack of further funding after 1972 made the situation more difficult, despite the appointment of a Field Archaeologist by the newly-formed North Hertfordshire District Council in 1974. Continued development in the town was away from the medieval centre, which meant that almost all new developments to the east uncovered parts of the Roman town. Much of the recording was carried out by Kit Westaway, a well-known local figure who had been the town’s first traffic warden. She was responsible for retrieving material from a cemetery beneath the convent on South Road. By this time, it was widely believed that as much was known about Roman Baldock as could ever be learned and it was with some reluctance that the Ancient Monuments Laboratory carried out a geophysical survey of Upper Walls Common in the spring of 1979. Using a proton magnetometer, buried ditches and pits were found stretching across the common, showing the locations of roads, enclosures and the probable sites of houses. This meant that when construction work on the new estate began in 1980, the forces of the North Hertfordshire Archaeological Society needed to be mobilised quickly. 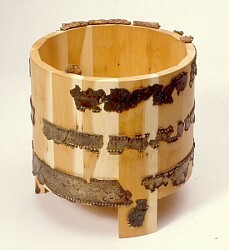 This new work was directed by Gil Burleigh, Keeper of Field Archaeology for North Hertfordshire Museums Service. An area towards the north-western edge of Upper Walls Common was selected for the first investigations in May 1980, as it had been intended to develop this end of the estate first. The first area to be excavated was the site of a large square enclosure, investigated over six seasons from 1980 to 1985. 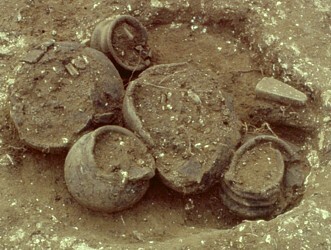 A Late Iron Age burial enclosure was found, with a burial pit at its centre containing a decorated bronze-bound wooden bucket, a pottery urn and pig carcasses. A second pit nearby contained the buried remains of the funeral pyre. In 1981, an area to the south-east that was known to have a broad parallel-ditched enclosure was investigated. This also proved to be Late Iron Age in date, with a circular building at its north end, apparently a shrine. At its mid point, the enclosure cut across a pit alignment, found to run for at least 1½ kilometres. A previously unknown cemetery was discovered by workmen in February 1982. The 1972 trial trenches had quite by chance missed the site. In the same year, a large area at the north-western end of Walls Field was developed as Hartsfield School. A small area crossed by the pit alignment was investigated, where the pits were found to have contained massive timber uprights. Work also took place on the school site in 1987, 1991 and 1994, before extensions to the building were constructed. 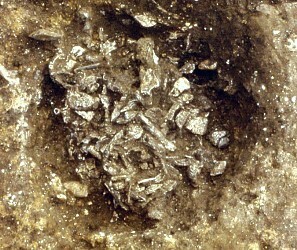 Also in 1982, investigation began of a small late Romano-British cemetery immediately to the north-west of the Late Iron Age burial enclosure. The cemetery – known as the California Cemetery – was notable for its variety of burial rites. South of the cemetery, a large natural dell was investigated. A sequence of occupation débris was covered with a cobbled surface, around AD 200. Late Roman activity was followed by a period when a lot of soil washed into the hollow. On top of this, a substantial post-built structure measuring 10 × 4 m was built; its appears to be a hall of ‘Dark Age’ type and is evidence for the continuing occupation of at least part of the site until the sixth century. In 1983, an area next to the large area excavated by Ian Stead in 1970-71 was investigated. Several wells were excavated; one contained numerous large flint nodules, while the second well yielded a fine collection of iron tools. A third well was excavated inside the enclosure examined by Ian Stead that is now thought to contain a temple. In the following year, further work took place on the late Roman cemetery close to the Iron Age burial enclosure. In 1984, it was discovered that this late Roman cemetery overlay a second, smaller Late Iron Age square burial enclosure, measuring about 8 × 9 m, with only two or three cremations inside it. In 1985, a small excavation and major salvage recording took place during the redevelopment of the former Kayser Bondor hosiery factory as a Tesco superstore. In 1986, a major excavation began on a cemetery beside the Royston Road that had originally been discovered by the trial trenching in 1972; work on the site continued intermittently until 1989. Subsequently, the remainder of the site was excavated in 1994. Three major but overlapping cemeteries were discovered; one was a somewhat scattered cremation cemetery (Yeomanry Drive North), another a mixed rite cemetery of Late Pre-Roman Iron Age to Sub-Roman date (Royston Road), and the third an Iron Age inhumation cemetery (Stane Street). In 1988, a new cemetery was discovered east of the Royston Road cemetery, in Icknield Way East. The first burials were found in foundation trenches for two new houses and only small areas were available for excavation. Even so, several rich Late Iron Age cremation burials in an enclosure and large numbers of Roman inhumation burials were found. They included an infant burial with a Dea Nutrix figurine and possible grave superstructure. During the early 1990s, a number of opportunities presented themselves to investigate parts of the settlement, rather than cemeteries around its edge. Excavations in the High Street, White Horse Street and Station Road showed evidence for buildings, quarrying and light industrial activity.